Another good one Nate. You're taking the task of stumping us too seriously. I am drawing blanks, do you feel charitable enough to toss a hint. Sure. The category is music. A guess here, Hank Williams. He died way too young. Jimmie Rogers, the "Father of country music." Al beat me to the punch. 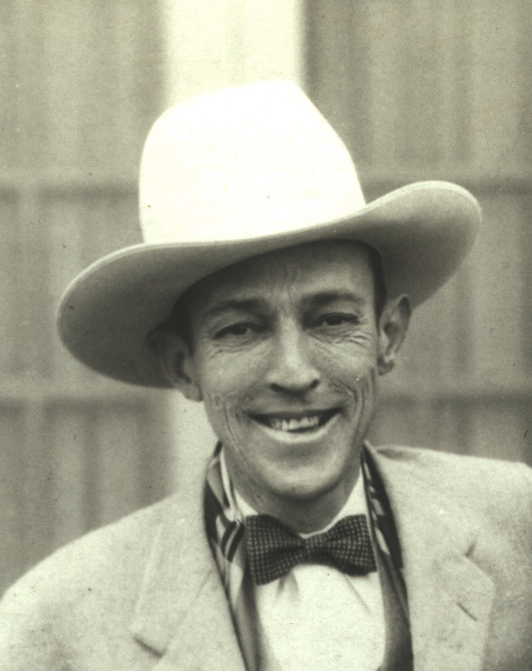 Jimmie Rogers, "the singin' brakeman"
Jimmie Rodgers came to Kerrville, Texas for the "climate". He was a patient at the tuberculosis hospital here. My Dad said Jimmie would get "cabin fever" while being isolated in the cottages on the grounds. He would sneak out some nights and hitch a ride into town. He would tell the guys to get him a guitar and a "pint"of whiskey. They would sit around on tailgats and listen to him sing until he became exhaused. Then they would give him a ride back to the hospital. He Built his mansion on a hill here in Kerrville. I think he lived there for a couple of years and then moved and later died at about thirty-years of age. The mansion is still standing today.